Tree diseases are illnesses in trees and shrubs caused by fungi, bacteria, and environmental stress such as extreme temperatures, drought/flooding, broken branches, and pollution. Although plants have natural immune systems, there are many times where Mother Nature cannot heal the tree from diseases on your property. In these cases fungicides, antibiotics, or other forms of treatment may be applied through injections, spraying, or soil drenches to control insects & diseases. Our Certified Arborists are trained, licensed, and experienced in diagnosing and treating insects and diseases using our SmartTreat™ Process. 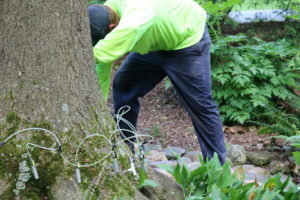 Our Arborists will create a customized program to treat the diseases and keep them from reoccurring in the future. RTEC’S SmartTreat™ process is a highly effective and environmentally sensitive approach to pest management in our suburban environment. The SmartTreat™ process uses the life cycles of insects and diseases and their interaction with the environment to provide more effective pest management solutions all while using fewer chemicals on your property. Tree Diseases can progress rapidly. As soon as you see signs that your tree is diseased call an Arborist to come take a look. If left untreated, over time the damage can become too extensive and the tree or shrub may not be able to be saved through disease treatments. Need Help With Tree Diseases? Caused by a fungus, this blight which has no cure has virtually wiped out the American Chesnut Tree. In 1904, it was first noticed on the American chestnuts in the New York Zoological Park, now known as the Bronx Zoo. While Chinese chestnut trees weren’t very vulnerable to the blight, American chestnuts had little resistance and succumbed quickly. By 1950, the destruction was complete. The once most predominant and majestic tree of our Eastern forests has been reduced to a handful of pre-blight survivors struggling to survive in the wild today. 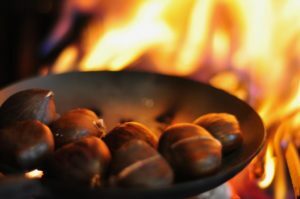 Occasionally you will see chestnuts pop up here and there; however, because the blight is still active they succumb quickly once they reach a certain size. Scientists and foundations are working on ways to fight the blight and bring back American Chestnuts. Learn More About The Chestnut Blight’s Cultural Impact and The Effort To Create Blight Resistant American Chesnuts. Discovered in New Jersey in the early 1990’s, this bacteria attacks shade trees and is caused by the xylem-clogging bacteria, Xylella fastidiosa. Xylem is one of the two types of transport tissues in trees; by clogging these tissues the bacteria restricts the flow of water from the roots to the crown of the tree. This dehydration causes the tree to appear to be under drought stress even when it has access to enough water. If left untreated this disease will cause dieback, secondary invaders, branch death, and ultimately death. 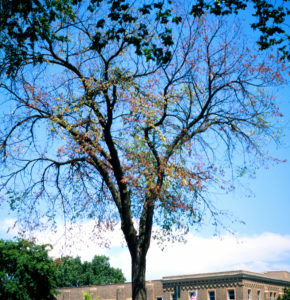 Dutch Elm Disease causes leaf wilting, curling and yellowing, premature leaf drop, and will eventually your tree. 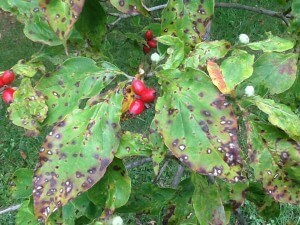 Native to North America, fire blight is a common and destructive illness caused by the bacterium Erwinia amylovor. The bacteria enters through open flowers and new shoots in the spring. Fire blight causes leaves to blacken and curl giving a fire scorched appearance and will cause lesions on the fruit and cankers on the branches and trunk. Without proper treatment, infected trees will die. 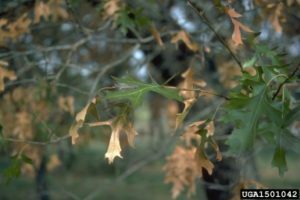 Oak wilt causes leaf discoloration, wilt, defoliation, and ultimately the death of the tree from the top down. Verticillium Wilt is a disease caused by the soil-borne fungi Verticillium albo-atrum and Verticillium dahliae. The fungus invades through the roots of susceptible trees and shrubs then spreads through the plant’s vascular system. Once the Xylem, the tree’s water transportation system, is infected it becomes clogged and water can no longer reach the tree’s leaves. 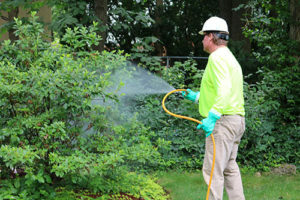 Verticillium is common and affects several hundred species of trees and shrubs. 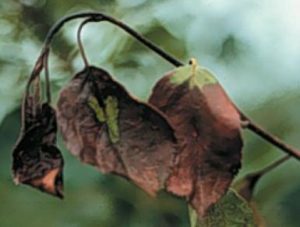 Verticillium Wilt causes leaf curling, drying, small yellow foliage, leaf scorch, and slow growth. Often times the symptoms are seen on one side or section of the tree. 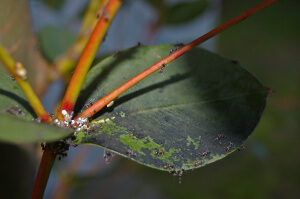 Honeydew is the excrement of plant sucking insects such as scale and aphids. Many homeowners confuse honeydew with sap. Trees do not drip sap. If you have “sap” dripping from your leaves it is honeydew and is a telltale sign of an insect infestation. Targets: The insects that cause honeydew and thus sooty mold to develop target hundreds of species. The most susceptible species in this are include; Maples, Oaks, Linden, Birch, Crape Myrtles, Ash, and Tulip Poplars. 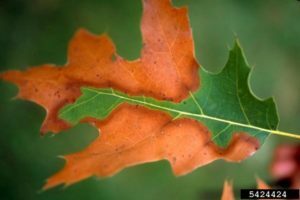 Leaf spot is a common term used to describe a number of tree diseases that leave spots on the foliage of trees and shrubs. Leaf spots are most commonly caused by fungi but can be caused by bacterial infections as well. One of the most well-known leaf spot diseases in our area is called, Anthracnose. The main symptom of leaf spot diseases is spotting on the tree’s leaves. 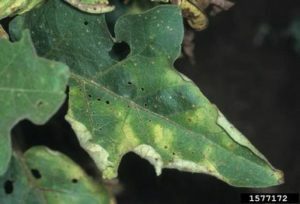 Spots will vary in size and color depending on the specific kind of leaf spot; however, most spots tend to be brownish. Targets: Dogwoods, Ash, Oaks Sycamores, Maples, and other deciduous hardwoods. Didn’t Find What You Were Looking For? Check out our Fungus and Bug indexes. Worried your tree is infected with one of these tree diseases? 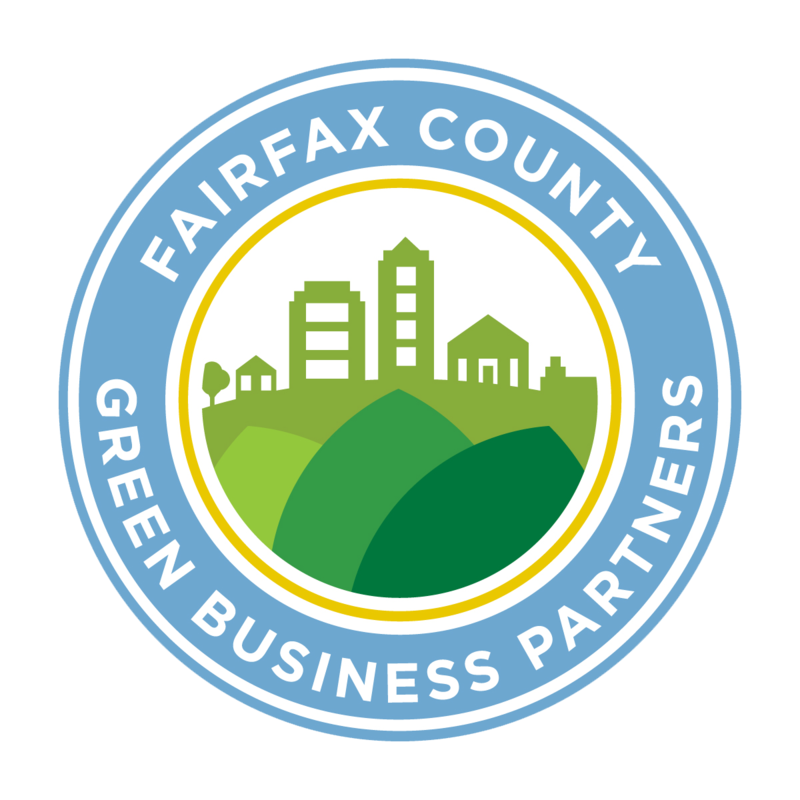 Use our online booking system or call 703.573.3029 to schedule a consultation with an arborist to diagnose your tree diseases.